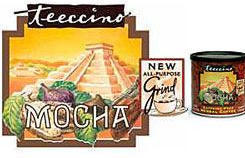 Teeccino is the first herbal coffee blended from herbs, grains, fruits,and nuts that are roasted, ground and brewed just like coffee.Teeccino contains 65 mg of potassium to give your body a natural energy lift. Size (inches): 4.33" X 4.33" X 4.33"
Roasted carob, barley, Chicory root, Figs, Almonds, Dates, Cocoa and natural Mocha flavour. No Propolene Glycol is used. No Propylene Glycol is used. Contains no coffee beans. Drip coffee maker: Into a filter, put 1 rounded tablespoon. for every 2 cups of water. French press pot: Add 1-2 Tablespoons to "3-Cup" pots, 3-4 Tablespoons to "8-cup" pots. Steep for 5 minutes, then press the plunger down.Adjust quantities to personal taste. Drink black or serve with half & half, milk, non-dairy milk or creamer. Iced Teeccino: Refrigerate brewed Teeccino. Add cold milk or non-dairy milk and sweeten to taste. Worked best for me when I used my electric percolator. I used one and one half tablespoons for 4 cups of coffee, and I used a fold-over coffee filter. Came out great! Tasted like I was drinking real coffee with a nice mocha flavor. Well done! At first I thought I didn't like Mochal Herbal Coffee, but I then realized I had put in too much coffee. I later switched from a French Press to making it in a personal-sized, drip coffee maker, and I reduced the amount of coffee I used. It was delicious! I am delighted with this product and would definitely buy it again!